The tomb of the Muslim saint Imam Asim lies in China’s Taklamakan Desert, at the end of a long walkway lined with poplar trees. 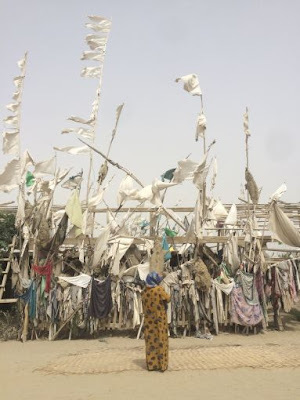 An elevated mud structure, the shrine would easily be camouflaged by the sand if not for the flags, rams’ skulls and strips of cloth decorating it. It is located near the town of Hotan, in the autonomous region of Xinjiang, in the country’s northwest— the homeland of the Turkic-speaking Uyghur Muslim community. For centuries, Uyghur Sufis would journey through the desert between shrines such as this one, stopping at each to recite poems celebrating religious heroes. Mohammad has lived near the shrine for most of his life; his father was also its guardian. He remembered how thousands of people would visit the shrine in May, when locals commemorated the anniversary of the saint’s death. But now, he said, the government has prohibited that ceremony, and Uyghurs come to the tomb in tens, at most. Before he could elaborate, a police car arrived at the shrine. Several personnel entered the building with large batons in hand, demanding that we leave. Mohammad turned around and returned to his room near the shrine’s entrance, glancing pointedly at a security camera hanging above his door. The crackdown on Uyghur places of worship is part of a larger programme of persecution of the minority group by the Chinese state. Uyghurs in schools or government offices are forbidden from wearing headscarves or fasting during Ramadan. Those under 18 years of age cannot enter mosques, young men cannot grow beards, and no one can wear clothing marked with a crescent moon. While these restrictions have existed for decades, their enforcement has intensified since 2009, after Xinjiang’s capital, Urumqi, was wracked by violent ethnic riots. In the wake of such repression, fear, militancy and ethnic strife have grown in Xinjiang. When I visited the region in June, Ramadan celebrations were muted. Even in the mostly Uyghur city of Yarkand, the streets were nearly empty in the evenings and only one restaurant was open for iftar. Uyghur families filled the tables to share meals of carrot, raisin and lamb pilaf, pulled noodles in beef stew, yogurt pitchers and plates of fruit. During Ramadan in 2014, ethnic riots broke out in Yarkand. According to Chinese state sources, at least 96 people were killed and 215 arrested when separatists attacked a police station. Local authorities’ discovery of suspicious explosives had prompted an extremist rampage, the state narrative went, as knife-wielding gangs terrorised the streets, burning cars, killing civilians and targeting government offices. In contrast, the US-sponsored Radio Free Asia reported that Chinese security forces massacred at least 2,000 Uyghurs after a violent riot over the extrajudicial killing of a Uyghur family that had disputed the headscarf restrictions. The state has adopted heavy-handed measures to stem such militancy. In November 2014, the prominent Uyghur intellectual Ilham Tohti was sentenced to life imprisonment on charges of separatism, after he criticised Chinese policies in Xinjiang. In November 2015, Chinese security forces killed 28 Uyghurs who they claimed were criminals responsible for the Aksu attack. But Radio Free Asia again disputed this, saying that those killed included innocent women and children. In everyday life, this crackdown can take the form of excessive police scrutiny. At a night market in Hotan, I saw Uyghurs and Han Chinese socialising, mostly speaking in Mandarin and eating each other’s versions of kebabs, dumplings and glutinous rice desserts. Yet police standing at the market entrance routinely searched passing Uyghurs, checking their IDs and mobile phones, all the while waving Han individuals through. One Uyghur policeman apologised to a Uyghur man as he was searched. “This is just policy,” he said. “We have to fill a quota of people that we’ve checked every day.” At least ten checkpoints exist on the 500-kilometre road between Hotan and Kashgar, where Uyghur travellers are thoroughly searched, and some forced to turn back. This strict policing may not even be in the interest of the Chinese state. Rian Thum, a scholar who recently published a book on Uyghur pilgrimages in southern Xinjiang, noted that the forms of Islam practised in many of the community’s shrines have long been peaceful alternatives to more extremist ideologies. “Many people involved in nationalist movements were very anti-shrine,” Thum told me over the phone. “The reformist or even fundamentalist approaches to Islam saw shrine veneration as a type of shirk—associating other deities with God.” Ironically, suppressing such types of Islam may only make Uyghurs more susceptible to calls for violent resistance. In Yarkand’s old-town area, I visited a state-designated tourist site: the mausoleum of Ammanishahan, a sixteenth-century queen famous for composing muqam—a type of traditional Uyghur opera. At the entrance, a sign read: “Great Mistress ad Poetress of Mukam Music: Ammanishahan’s Mausoleum,” in English, with adjacent translations in Mandarin and Uyghur. The mausoleum sat beside a garden filled with engraved white tombs. The Chinese government had spent 420,000 renminbi in 1993 to restore this site, an informational sign read. Ammanishahan’s muqams are “a jewel in the brilliant treasure chest of Chinese ethnic culture,” another added. One pair of Han tourists walked around the otherwise empty site, their 20-renminbi entrance tickets in hand.